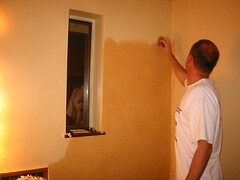 The last couple of nights I have been working on repainting our master bath. The existing wall paper is pretty wild and 70's like. We have been putting up with it for two years now, but Esther said it was time for the new look. I basically used the same colors for the base and glazing that I had in the bedroom, but it turned out a lot darker. It's a good thing the bathroom is large and very light with a skylight. Tonight we are preparing for company, as we will have the house full for the next several days. Bjorn is even returning home late tonight.